It can be difficult to keep up with ever-changing trends, but Hilary Alexander, fashion director for The Telegraph explained it this way: “The speed of change of fashion is what keeps the high street lively.” Contrary to what we may believe, change is consumer-led. A constant stream of new styles is what keeps us all looking fresh and, yes, it’s all kinds of fun to try out the latest trends. As we near closer and closer to 2019, what will happen to the trends we embraced in 2017 and are still embracing in 2018? The List spoke with fashion experts and discovered what should get left behind— and their answers may surprise you. Of course, just when you were finally coming around to appreciate the high-waisted jeans, they’re headed to their funeral. 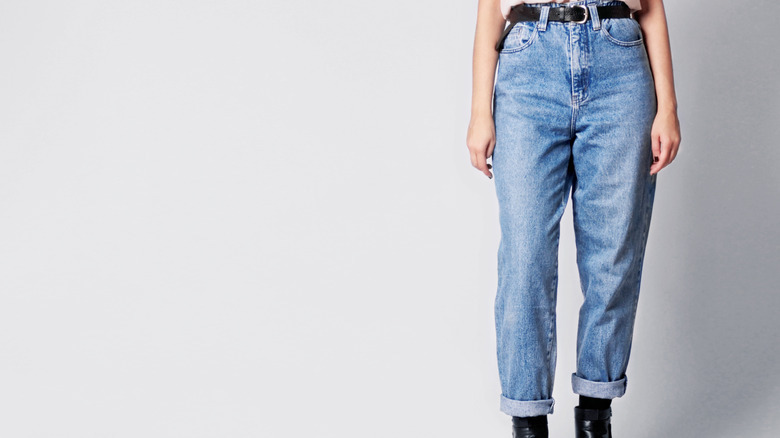 Anne E. Appleby, a sociologist and designer who studies current trends, told The List, “Mom jeans go in and out. Next year, they will go out because they have been so overdone in the last few years.” Appleby made the comparison between this denim trend and one we likely all remember — and probably wish to forget — in the ’90s: low-rise jeans. The horror. Walk in to your local department store and you won’t be able to swing a stick without hitting bell-sleeved blouses. Erm, not that we’re recommending you take a stick into the mall. In 2015, bell sleeves began emerging from the catacombs of the 1970s. “Stylistically, it was a free-for-all,” designer Betsey Johnson said of the decade to The New York Times. A free-for-all that included copious amounts of billowy frocks. Bell sleeves, flared pants, and a whole lot of suede defined the era. Although it may have been hard to imagine the wild trends coming back, that’s exactly what they did. And hard. Bell sleeves, especially. Similar to what happened with mom jeans, fashion expert Anne E. Appleby explained to The List that bell sleeves have officially been overdone. Bell sleeves also have the disadvantage of being “not so practical.” Appleby opined, “You drag those sleeves over everything.” For. Real. In September 2018, Who What Wear reported that leopard print was “particularly booming” ahead of the fall and winter seasons. Elyse Johnson, a former buyer for TJX Corporation and a wardrobe stylist for the Emmy-winning show The List (great name, might we add, but no relation) agreed, saying, “Leopard is back for fall.” Woot woot! Before you get too excited and start buying all leopard print everything, you should know that the bold animal print has a significantly reduced life expectancy. “That trend will be extinct in 2019,” the stylist clarified, “It always has a good strong go and then quickly hibernates for a few years.” So, while leopard print is an endangered trend at the moment, feel free to wear it up and wear it out — or at least put it in the back of your closet until it’s back on trend again at some point in the 2020s.